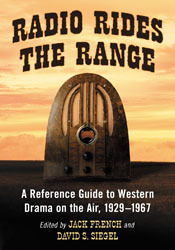 Radio Rides the Range covers almost every western drama that ever aired for which information could be found, as well as many programs which did not get beyond the audition phase. While many of the early cowboy programs were directed toward juveniles (Bobby Benson, Maverick Jim, The Cisco Kid, etc.) as were the "legend and lore" programs which highlighted Native American culture and stories (Lone Wolf Tribe, Eagle Wing, the Navaho, The Lone Indian, etc.) , by the late 1940s, the "adult western" began to slowly evolve with shows like Frontier Town. By the 1950's, CBS was airing such classics as Gunsmoke, Fort Laramie, and Frontier Gentleman. Anthology western programs reached their zenith in the 1960's through the productions of the Armed Forces Radio & Television Service in Horizons West and When the West Was Young. Although Roy Rogers and Gene Autry were very successful at the radio mike and their network shows pulled good ratings, many of the other Hollywood cowboys struck out. William S. Hart made a radio audition (based on one of his silent movies) but the program never aired. "Will Bill" Elliott also was unable to get beyond the audition stage with his radio plans. Ken Maynard briefly hosted a syndicated radio show regionally that had little success. Tex Ritter was in the supporting casts of a few western radio shows, but never was in a leading role of any network drama. Tom Mix lent his name to a long-running juvenile western but he never appeared on the show; it ran for several years after his death. Soap operas as western drama were relatively scarce on the airwaves, although a few were broadcast. Cactus Kate (1930s) and Woman of America (1940s) were set in the old west's frontier days while Lone Journey (1940-1952) took place in modern day Montana. While women writers, directors, and producers were not prominent in most of the western drama broadcasts, Radio Rides the Range details those who were successful, including (Mary) Kathleen Hite, who wrote many scripts for Gunsmoke and Fort Laramie, Ruth Woodman who researched and wrote many of the Death Valley Days scripts and Mary Afflick, who directed the Tom Mix show for years. Native Americans were featured as co-leads in a number of western programs. Tonto in The Lone Ranger, Little Beaver in Red Ryder, and Harka in Bobby Benson. The only leading character in a western series who was a Native American was Straight Arrow, in the radio series of the same name; he was a Comanche Indian, whose secret identity was that of a white rancher named "Steve Adams."